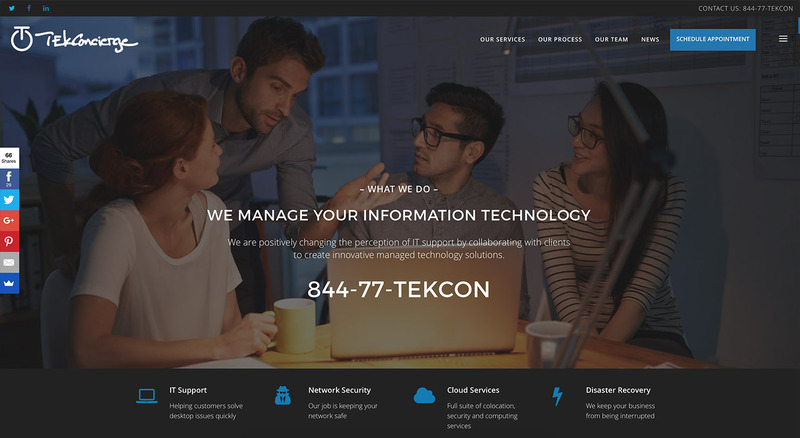 Earlier this year we launched a new website for a great client called Tekconcierge. Tekconcierge provides outsourced managed IT support services for businesses. When we first started working for them we created a website with a little bit more of a “concierge” feel and tried to move a little bit away from the standard feel of a technology site. However, as we continued to work with them creating leads and driving traffic to their site, it became more clear that we needed to help them tell their story better. We are fans of Donald Miller and Storybrand and we wanted to make sure that TekConcierge’s website passed the grunt test. What is the grunt test? It basically asks the question, “could a caveman come to your site and grunt out what you do in 5 seconds or less?” Your story needs to be that clear. TekConcierge provides IT Support. It would be super tempting to put a huge list of every single service they handle that falls under that umbrella on the homepage, but that is often distracting to the customers. But how do you tell a simple story and still rank well with organic search in search engines? It can be a tricky balance. At ChemistCreative we are creating proven processes for our customers that help drive traffic to specific pages on their sites using a variety of tools. We start with Moz.com, SEMRush.com as well as a handful of SEO plugins (Toast, SUMO). Pages nowadays have to be light and nimble, keyword rich, full of well-written content and look great on both desktop and mobile. As a web designer my initial focus is on design and user experience, but the focus now has shifted to conversions. So now we create great websites with a focus on lead generation, capturing those leads, and then turning those leads into conversions. We don’t want to help our customers just get email addresses, we want our clients to get credit cards. A beautiful website is pointless if it is not converting customers. That does not mean we won’t continue to focus on beautiful websites as we know that quality and beauty inspire trust and trust is why people buy.